Brewer Description: (from website) mc² is Photon’s big brother. We literally took Photon’s hopping rate and squared it. This DIPA is our tribute to the amazing relationship that energy and mass are balanced, proportional to the speed of a photon squared. It pours a hazy tangerine color, releasing bright tropical notes of mango, pineapple, and apricot. 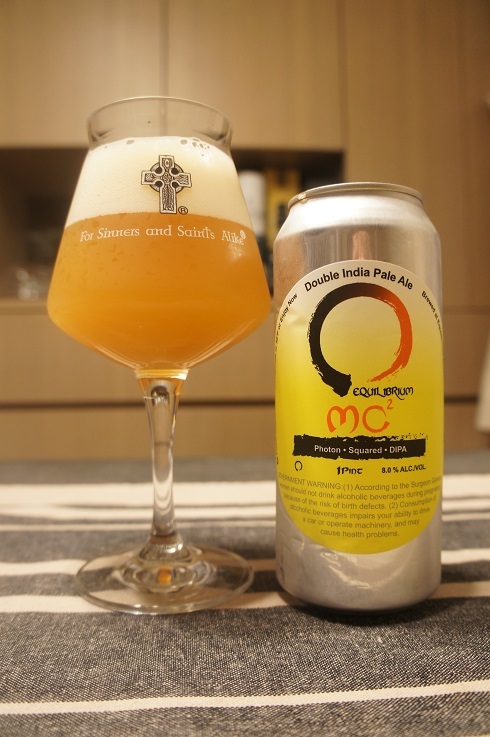 mc² tastes like succulent mango juice loaded with chewy hop resins. It’s very drinkable for 8.0%; be careful, this one can sneak up on you. Intro: A 1 pint can, with no canned on or best before date. Poured into a Lost Abbey teku glass. Appearance: A hazy dark orange colour with a two finger fluffy pillowy white head that had excellent retention and left lots of nice sticky lacing. Aroma: Every time I give it a swirl, it gives me a blast of this wonderful fresh mango juice aroma. As it settles, hints of grapefruit, mandarin peel and pine appear. Taste: Tropical and citrusy fruits with mango, papaya, melon, grapefruit and citrus rind juiciness at the beginning followed by a nice light lingering bitterness and spice on the finish. Overall: Taste doesn’t quite live up to the stunning aromas that I experienced, but nonetheless, its juicy, refreshing and easy to drink.